Viewers in the United States can watch the documentary on the EPIX network, on EpixHD.com and on EPIX apps. The tribute continues on EPIX with commercial-free airings of classic Bond films Diamonds are Forever, From Russia with Love, On Her Majesty's Secret Service, The Man with the Golden Gun, Moonraker, The Living Daylights and Never Say Never Again all as part of a free preview weekend for all subscribers of EPIX distribution partners. 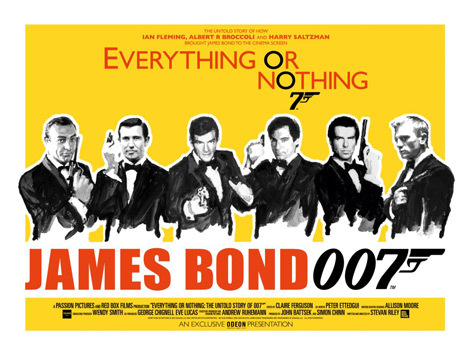 The documentary Everything or Nothing: The Untold Story of 007 is directed by Stevan Riley (Fire in Babylon) and produced by John Battsek (One Day In September, The Tillman Story) and Simon Chinn (Man on Wire). Everything or Nothing focuses on three men with a shared dream: Bond producer Albert R. Broccoli, Harry Saltzman, and author Ian Fleming. It's the thrilling and inspiring narrative behind the durability, popularity and survival of the longest running film franchise in cinema history since Mr. Bond hit the big screen in 1962. "From Sean Connery and Roger Moore, to Pierce Brosnan and Daniel Craig - the integrity of Bond has never changed and has never been more entertaining. Our documentary and movie marathon is a great way for us to reach our viewers and we're pleased to partner with all our distribution partners to bring the background of this iconic spy to all their subscribers just in time for his latest adventure, Skyfall," said Mark Greenberg, EPIX President and CEO. In the UK, the film will be released through Sony Pictures Releasing UK on an exclusive basis with Odeon Cinemas in selected locations: http://www.odeon.co.uk.